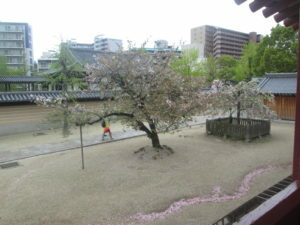 Shitennō-ji is a Buddhist temple in Ōsaka, Japan. 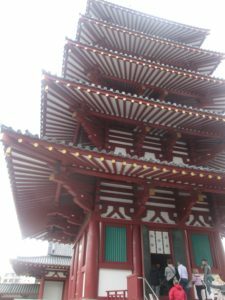 It is sometimes regarded as the first Buddhist and oldest officially administered temple in Japan, although the temple buildings have been rebuilt over the centuries. Prince Shōtoku invited three Korean Baekje carpenters, and they constructed this temple in 593. Prince Shōtoku was known for his profound Buddhist faith when Buddhism was not widespread in Japan. 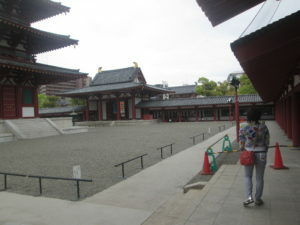 Most of the present structures are from when the temple was last completely rebuilt in 1963. 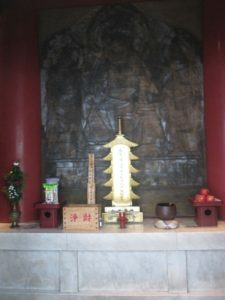 One of the members involved in the initial construction of the temple in the 6th century later established a firm Kongō Gumi, specialized in temple and shrine buildings over centuries. 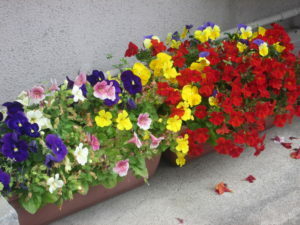 The Shitennō are believed to be four heavenly kings. The temple Prince Shōtoku built to honor them had four institutions, each to help the Japanese attain a higher level of civilization. 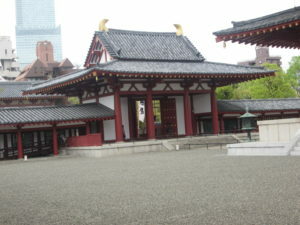 This Shika-in (Four Institutions?) 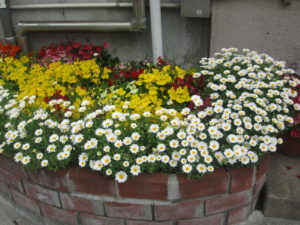 was centered on the seven-building garan (the complex inside the walls), and included a Kyōden-in (Institution of Religion and Education), a Hiden-in (welfare Institution), a Ryōbyō-in (hospital), and a Seiyaku-in (pharmacy) to provide essential care to the people of Japan. 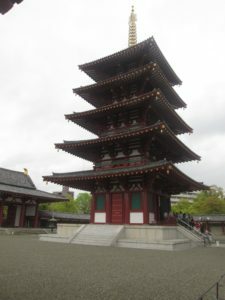 The garan consists of a five-story pagoda, a main Golden Pavilion (Kondō) housing an image of the Bodhisattva Kannon, and a Kōdō (Lecture Hall) under a covered corridor holding three gates (the Deva Gate, the Western Gate, and the Eastern Gate). 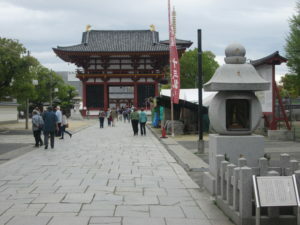 Surrounding this central complex are the Great South Gate (Nandaimon), and a Great East Gate (Higashi-no-ō’mon). 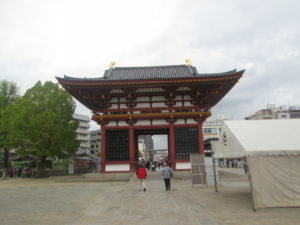 To the west is the Great West Gate (Nishi-no-ō’mon), also known as Gokuraku-mon . Further to the west is a stone torii, which is widely accepted as the Eastern Gate to the gokuraku-jōdo (Western Paradise, or the Pure Land?). 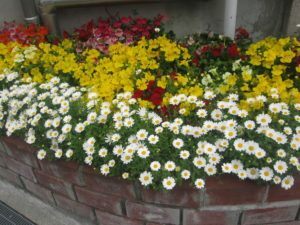 Flower Boxes in the street outside …. The Great West Gate …..
Cherry Blossum’s out in the Courtyard ….